Homemade noodles are soooooo much better than any sort of dried varieties. They are pretty easy to make, but do take a bit of time. This noodle method is my moms, who until recently didn't have a pasta machine. It makes thick, rustic, and delicious noodles. Rustic is a fancy way to say uneven. Wisk 2 eggs, add 1/2C water. Add 1C flour and mix until smooth, add more flour until the dough comes together. Add more flour and knead with your hands until the dough becomes stiff. I used about 2 1/2C all purpose flour. Let rest for 10 minutes. After ten minutes, roll out the dough as thin as you can/dare on a floured surface. Let it rest another ten minutes. Lift the dough, lightly flour surface again, flour top of dough, and roll out again. Cut into 1/2cm x 2in strips with a pizza cutter (specific mom instructions here). If you have never heard of centimeters, just cut them 1/4in wide or however wide you want (see rustic note above). They can now be cooked in boiling, salted water for 3 minutes. They can be eaten with simple olive oil and black pepper. I prefer another pasta sauce. This one was improvised so that I didn't have to go grocery shopping. I started by sauteing 3 sliced shallots and a garlic clove in olive oil. 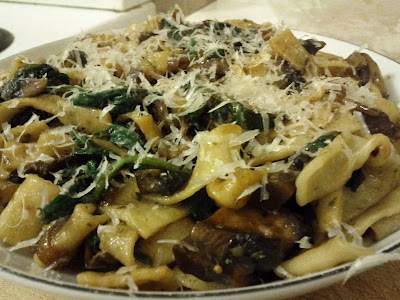 I added a chopped portabella mushroom and a splash of white wine to get them started. Once they had absorbed most of the liquid, I added a splash of tamari sauce, more white wine, half a zucchini, some homemade habanero hot sauce, and a handful of spinach. When everything is cooked, add the cooked pasta with a little bit of pasta water. Coat the pasta in the sauce and serve with parmesan and black pepper. *Update* After writing this post, I made myself really hungry and had to have these again. Without most of the ingredients in the above sauce, I improvised again. This time I sauteed 4 quartered shallots in olive oil, added the other half of zucchini and 4 anchovies. I added a splash of white wine to help it along, and some pasta water when that dried up. To finish it off, I added 2 Tbsp cilantro basil pesto. 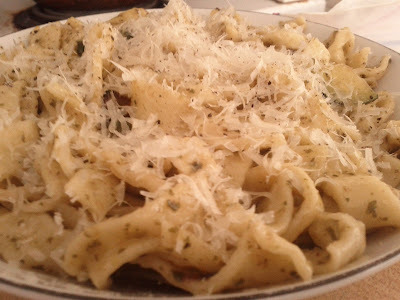 After tossing the cooked pasta in the sauce, serve with fresh grated Parmesan cheese and black pepper.